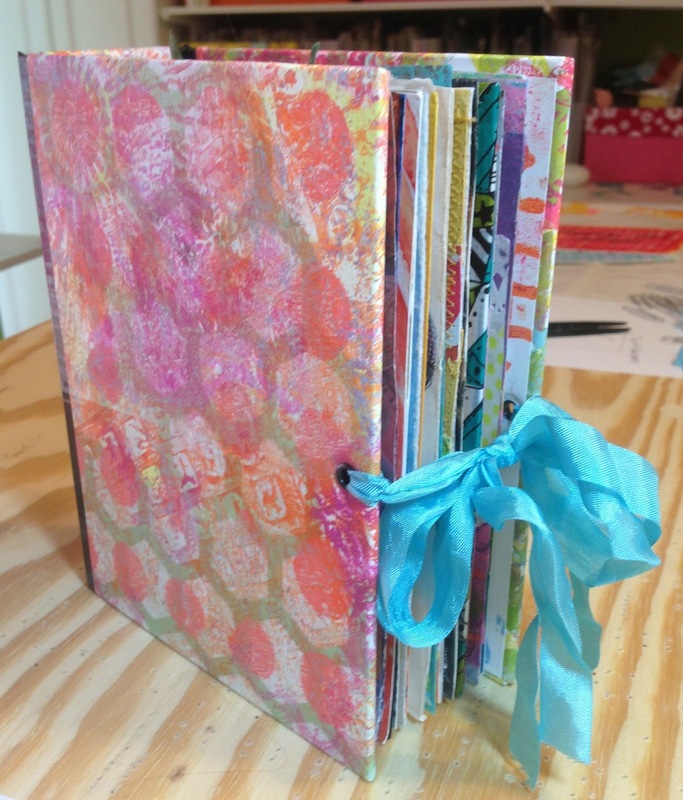 I am super excited to announce my very first Bookbinding Tutorial. 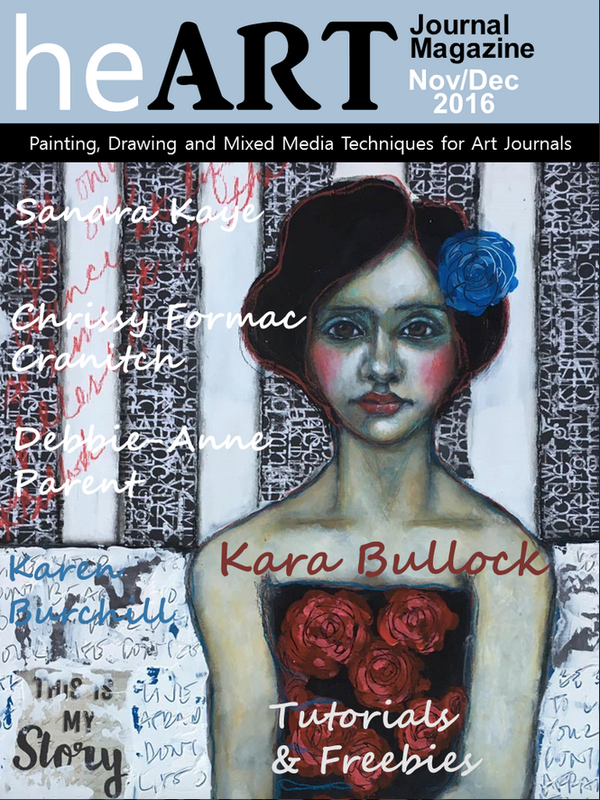 I am the proud Swap Momma to an amazing group of artist's. They send me their artwork every month for me to swap out...to date I have 27 states, and 8 countries swapping with me. Some of these wonderful ladies have been swapping for 6 months or more....so, the question has come up..."What do I do with these cards now?". With that question popping up often...I set out to make a book that would hold the cards...without damaging any of the artwork. Writing instructions and taking pictures as you make your idea...is a lot of work!!! 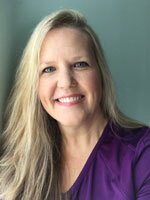 But, I am really happy with the end results. 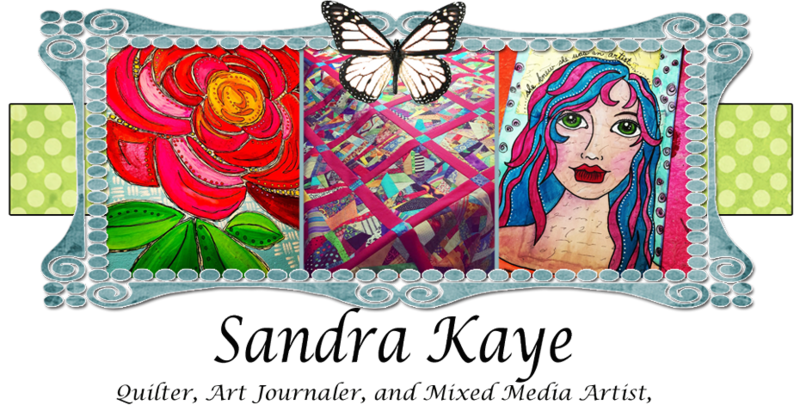 Here is a peek into my book already filled up with artwork!!!! I love that I can see both the front and the back of each piece....I want to see the signatures of the different artist. 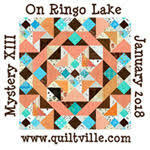 You can see one of Emily L.'s beautiful mandalas. 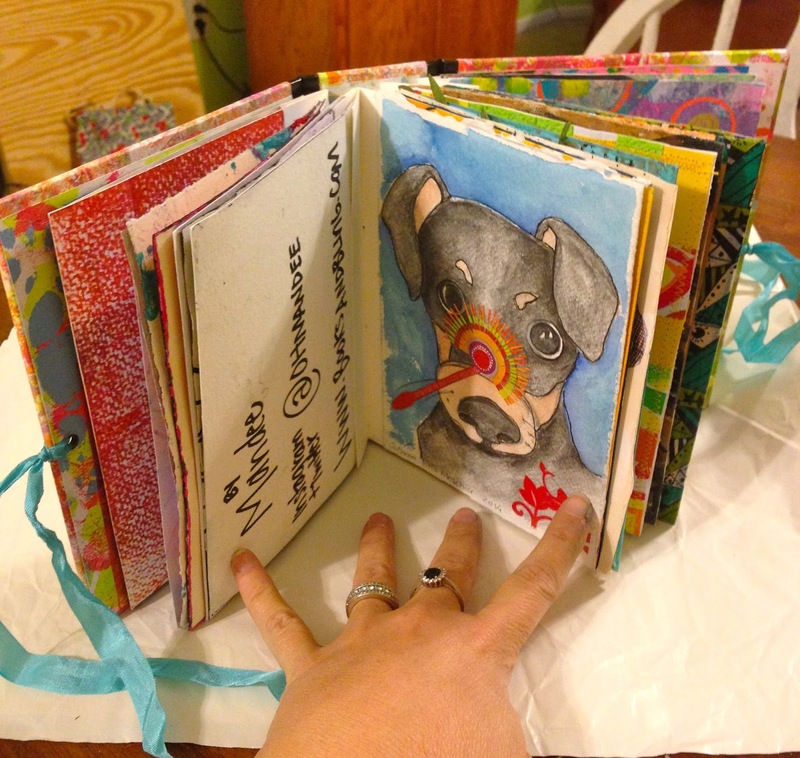 Here is Susanne M. adorable watercolor puppy card. and then Kelli R. lovely layered heart cards. 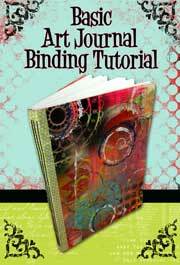 The Bookbinding Tutorial is available for $5.00. You will get step by step pictures, and instructions on how to make the above book. 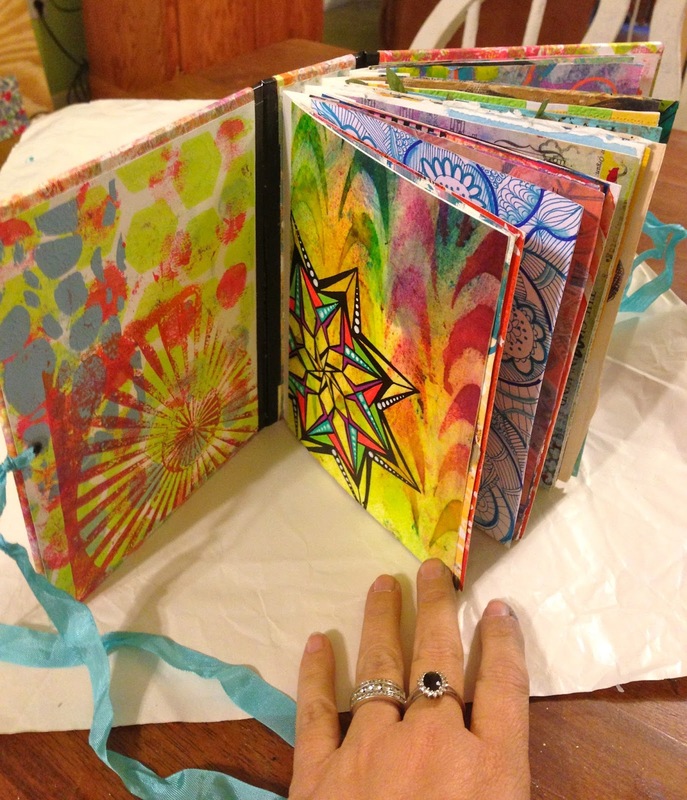 With a few small changes I also show you how to make an art journal. So, you are getting instructions for 2 books. This is a basic bookbinding tutorial...so, you do not need to have previous knowledge of bookbinding. 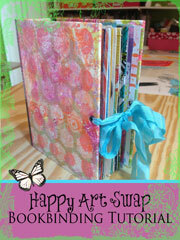 Purchase the Happy Art Swap Bookbinding Tutorial HERE. 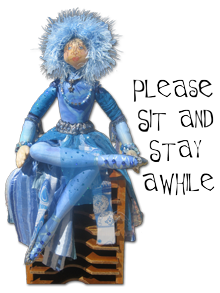 ....and for those who are super busy and don't have the time to make a book...but, would love to have one....I made 4 books. All ready for you to put your Happy Art cards in. Each book holds 24 cards. 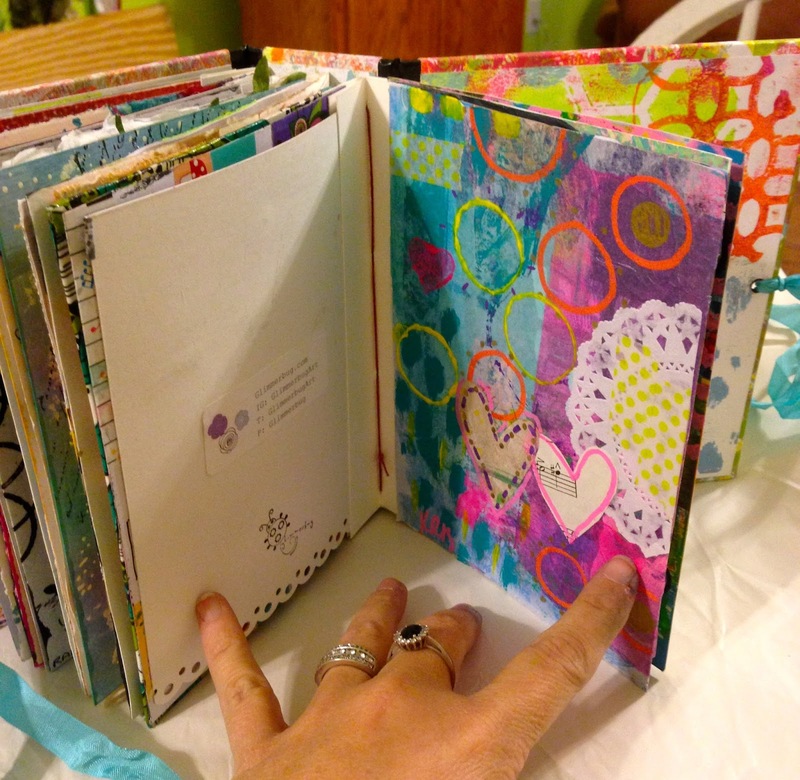 I pulled out my Gelli-plate sheets and decorated these books with them. They even have ribbon closures already to go. These books are for sale in my Etsy shop for $25.00 each plus shipping....and If you buy one of these books...I will throw in an original Happy Art Swap card from ME :):):) You don't have to do anything....but, put your cards in....the book will come with instructions on how to do that. Find my Etsy shop HERE!! Fabulous idea! Great job for the tutorial. I am so glad you are starting to publish your artsy ideas! Great job Sis!!! !